Ian Anderson was born September 11th, 1954 in Edinburgh, Scotland. Ian started his career at the age of 16, with Dundee F.C. He made his debut versus Clyde in August 1972 and he scored his first goal in the 1973 league cup at Partick Thistle. Ian established himself in the first team during the 1974/75 season and he scored four times as well as featuring in the UEFA cup against RWD Molenbeek. In December 1975, would eventually move to Scottish first division side St. Johnstone at the age of 20, where he became known as ‘Jaws’ for his fierce tackling in midfield. He would mature into an Under-23 International with Scotland. Had previously played 12 times for the Under-18's. Was even a successful youth coach, having led the Salvesen Boys Club (12 year olds) to the National Trophy. He led "The Saints" in scoring in 1976 with 12 goals from midfield. 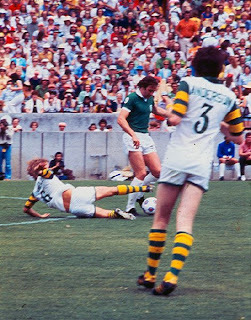 In 1977, he joined the Rowdies on loan, Ian scored on his debut against the New York Cosmos in a 4-2 victory, made more famous for Franz Beckenbauer's debut. Could play either in a midfield role or as a full-back. Played in 11 games and scored 2 goals that season. In 1978, Houston Hurricane purchased Ian's contract from St. Johnstone, and was immediately installed as captain. Was known as Houston's "Iron Man" - he was named "Hurricane of the Year" and "Top Team Defender" for 1979. During his three seasons in Houston, Ian would make a total of 89 appearances and scoring 17 goals. He played more games than anyone in the Hurricane's history. 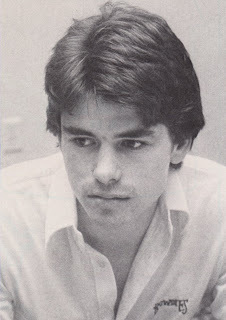 He would also be one of the top 10 scorers in the indoor league while on loan to Houston's Summit soccer team for the 1978-79 winter season, and the league's leading scorer through the first seven games until he was sidelined temporarily with a sprained ankle. In 1981, Ian rejoined the Rowdies, after they had acquired him in a special dispersal draft in December 1980. 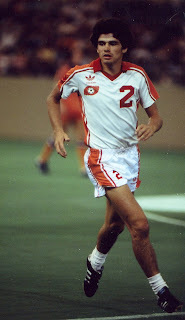 But he could not join the Rowdies until finishing a season with the MISL Cleveland Force. During 1981, he would continue in the same manner, putting in 32 appearances and adding 2 goals to his tally. An excellent player. Sadly, Ian Anderson sadly passed away 5th November, aged 54. Very sad news, at such a young age. Condolences to his wife Jackie, and to all his family and friends.